This year IBPS has invited applications for Clerical Cadre posts to fill 7883 vacancies. The exam is taking place in 4 shifts i.e 9:00 AM – 10:00 AM, 11:30 – 12:30, 2:00 – 3:00 PM and 4:30 – 5:30 PM. 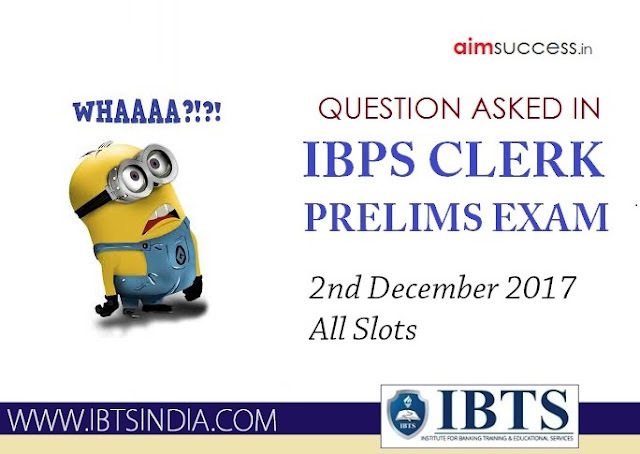 We have compiled the list of questions asked in today’s IBPS Clerk Prelims Exam to help you prepare better for the upcoming slots. Read the below article carefully on Questions Asked in IBPS Clerk Prelims 2nd December 2017 - All Slots to see which topic is being asked the most, types of questions etc. 2 3 6 15 45 ? 10 12 16 24 40 ? 310 220 148 92 50 20 ? 2. Profit & Loss: Two items A and B cost price equal, item A sold at 40% profit and item B sold at 20%less than the selling price of item A, total profit is 189.find the cost price of A? 3. A shopkeeper sold a mobile phone for Rs.12000. Had he offered discount of 10% on the Selling Price, there would be a loss of 4%. What is the Cost Price of that Mobile phone? 4. The average age is 19 years of a class. While the average age of girls is 18 and the average age of boys is 21. If the number of girls is 16 then find the total number of students in the class. 6. X+y+z=92 z=2y/3 y-20=x find x? Eight friends P, Q, R, S, T, U, V and W are sitting in a straight line (but not necessarily in the sam order). Some of them are facing south while some are facing north. (Note: Facing the same direction means. If one is facing north then the other also faces north and vice versa. Facing opposite directions means. If one is facing North then the other faces south and Vice Versa).W faces north. R sits at one of the extreme ends of the line. P sits third to the left of R. S, is not an immediate neighbour of R. V, sits third to the right of P. Q sits to the immediate right of V. Q does not sits at any of the extreme end of the line. Only one person sits between U and S. V sits second to the left of U. T sits second to the right of Q. Both the immediate neighbour of V faces the same direction. Both the immediate neighbour of P faces the opposite direction. T faces the direction as Q and W face the direction as U. When Hurricane Harvey loomed off the coast of my home state of Texas, it seemed to fill the entire Gulf of Mexico. When it roared on land, it pummeled the towns of Rockport and Port Aransas, whose tawny beaches I’ve walked with my kids, pointing out the indigo sails of Portuguese man o’ war jellyfish. Harvey’s eye took direct aim at the University of Texas’ Marine Science Institute, flattening not just the facility itself, but priceless samples awaiting analysis. After Harvey left Port Aransas, it spun back into the Gulf of Mexico over record sea temperatures as great as 4 degrees Fahrenheit above normal. Thermodynamic laws require that warmer air holds more water vapor. The heat armed the storm with a mighty arsenal of water vapor. Then Harvey returned to land, dumping a catastrophic amount of rain on Houston. My Facebook feed filled with pleas for rescue from the rising waters. Friends’ houses flooded — houses that had always been on dry land before. A chemical plant blew up, twice. Toxic chemicals oozed from Superfund sites. Dozens died in the deluge, mostly by drowning. And all the while, alongside the heartbreak and horror, I kept thinking about a strange harbinger: jellyfish. Diaphanous in form yet menacing in sting, jellyfish have a powerful capacity to capture our imagination. They undulate in a primal rhythm, blinking open and closed like eyes that can peer into the soul of the sea. And what they are seeing are changes produced by us here on land. Because we burn fossil fuels, which release greenhouse gasses, not just the atmosphere but ocean waters are warming. At the same time, our ship traffic transports animals to new places, and sometimes these exotics find home-like conditions where in the past those conditions would have been unsuitable. That’s what happened in the eastern Mediterranean, where a jellyfish from the tropical Indian Ocean has found warm, homey waters and now forms huge aggregations called blooms that stretch for tens of miles every summer. The fierce stings of these animals chase beach-goers out of the water. Their gooey bodies clog machinery at power plants, halting operations. The rampant coastal development provides new habitat for a jellyfish stage called a polyp that looks like a sea anemone. When it finds a hard surface like a dock or a jetty to grow on, a single polyp can proliferate into a dozen or even more medusae. And fields of polyps grow on those hard structures. That’s likely what happened off the coast of Italy, where gas platforms are thought to be the home for a new invasion of jellyfish. In the twentieth century in the Adriatic Sea, moon jellies, pinkish with their characteristic four-leafed clover on top, were a rarity. Now they are ubiquitous. And as we wash pollution into our waters, we create low-oxygen environments. Some jellyfish, with their low metabolic rate due to their a-cellular jelly insides, can survive more easily there than fish, with their oxygen-guzzling muscled tissues. And our lack of oversight of the fishing industry, which has removed more than 90% of the large fish from the seas, has depleted the predators of jellyfish as well as their competitors. Jellyfish are eaten by some fish, and jellyfish eat the same small zooplankton that fish do. The ecological vacuum left by unrestrained fishing can allow jellyfish to expand their influence in marine ecosystems. That’s what happened off the coast of Namibia, once one of the world’s most productive fisheries. Prior to 1960s, the rich Benguela current nourished a yield of a million tons of fish annually, until a fishing free-for-all depleted the ecosystem. Today, Namibian waters contain three times more jellyfish than fish by weight. There are reports of seabirds and seals starving. While researching jellyfish for the last six years, I’ve grown to understand that in the places where these large, pervasive jellyfish blooms occur, our oceans’ systems are out of whack. The blooms are a call for us to become better stewards of our oceans. There’s a real disconnect between us on land and what happens in the ocean. We are ultimately terrestrial creatures. It’s easy to ignore a power plant clog in the Mediterranean, a marine ecosystem disrupted in Japan, a fishing industry lost in Namibia. There seem to be more pressing things closer at hand. But this summer proved that disconnect is dangerous. Hurricane Harvey was, even more, evidence that what the jellyfish are telling us about the damaged oceans is not just a warning about an off-in-the-future time or a place somewhere else. This is not a vague the-world-is-all-connected idea. Harvey is a tangible, physical cost of our disregard. The health of the ocean is our health too. What were authors view on Jellyfish & Hurricane Harvey? Direct Questions also were asked on this passage – 3 Qs. One other Indirect Question was asked. 2. Directions : The following questions consist of a single sentence with one blank only. You are given six words denominated by A, B, C, D, E and F as answer choices and from the six choices you have to pick two correct answers, either of which will make the sentence meaningfully complete. 1. It has come to the notice of RBI that some Banks are illegally mobilising funds from the public by making false promise of ________ rates of return/interest under various schemes. 2. Defence Minister will meet two groups of people who will give him the ________ on the deteriorating law-and-order situation in Doklam. 1) 84, 85, 89, 98, 114, ? 2) 195 , 220 , 200 , 215 , 205 , ? 3) 2 , 16 , 64 , 128 , 128 , ? 1). Two items A and B cost price equal, item A sold at 40% profit and item B sold at 20%less than the selling price of item A, total profit is 189.find the cost price of A? 160 + 10 × 45 ÷ 30 – 25 = ? Sum of Money invested in two schemes, in scheme A, X principle with 8 % per annum and in scheme B with X+1400 principle for 2 years and difference is 189. Find the value of X? Average age of A and B, 2 years ago was 26. If age of A 5 years hence is 40 yrs, and B is 5 year younger to C, then find difference between age of A and C? Cost price of two articles is same. A trade man got profit of 40% on first article. The selling price of second article is 25% less than first article, then find overall profit percent? Length of rectangle is 80% of diagonal of square of area 1225, then find area of rectangle if its perimeter is 94√2. Annual salary of Arun is 7.68 lac. If he spends 12000 on his children’s, 1/13th of rest in food, 8000 in mutual funds, then find the monthly saving he is left with. A can do a work in 24 days, B is 20% more efficient than A. If C can do the work in 10 more days than B, find days taken by A and C together to complete the work. The ratio of Milk to water is 5:4, if two litres of water is added, ratio becomes 10:9, then find new amount of water in the mixture. Sum of 4 consecutive even numbers is 81 more than the sum of 3 consecutive odd numbers, sum of last even and odd number is 59. Find the difference between largest even and largest odd numbers? Ratio of speed of boat down stream and speed of stream is 9:1, speed of current is 3 km per hr, find distance travelled upstream in 5 hours. Average of X, Y, Z is 24, X:Y = 2:3, X+Y = 60, then find X-Y=? 8 person seating in row some facing north and some facing south. The left of R, only 3 persons are there, three person between R and Q, more than 2 person between B and S, D is second left of S. person side of R facing south, person side of p face in same direction. C is second right of A. A and P in opposite direction, B and Q face in opposite direction. As per the number of persons lives above Y is same as number of persons lives below S.
Reading Comprehension – Based on “Health Research”. 3. 46% of 600+ 44% of 225=? Data Interpretation – 05 stores i.e A, B, C, D & E sold books on 5 different weekdays. Q. Two years hence the average age of A & B is 37. Three years ago the age of B is 36. If C is 11 years older than A then, find the sum of present ages of A & C? 4) Which of the following will come in place of the question mark? 5)Which of the following will come in the place of question mark? Reading Comprehension – Passage was based on the “China’s contribution to the world regarding deforestation and its implications around the world”. Reading Comprehension was based on ""Hurricanes, cyclones and typhoons are all tropical storms. ".